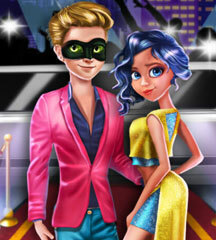 This cute couple is going to a red carpet event! Our girl is in a hurry, because she is not dressed yet. Help this pretty girl get ready on time! First, choose a glamorous makeup for her and after that pick an elegant dress, perfect for this special event. Enjoy!